Ants form colonies that range in size from a few dozen predatory individuals living in small natural cavities to highly organized colonies which may occupy large territories and consist of millions of individuals. These larger colonies consist mostly of sterile wingless females forming castes of "workers", "soldiers", or other specialized groups. Nearly all ant colonies also have some fertile males called "drones" and one or more fertile females called "queens". The colonies are sometimes described as superorganisms because the ants appear to operate as a unified entity, collectively working together to support the colony. 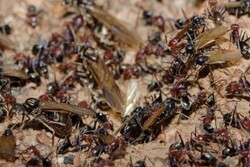 Ants have colonized almost every landmass on Earth. The only places lacking indigenous ants are Antarctica and a few remote or inhospitable islands. Ants thrive in most ecosystems, and may form 15–25% of the terrestrial animal biomass. Their success in so many environments has been attributed to their social organization and their ability to modify habitats, tap resources, and defend themselves. Their long co-evolution with other species has led to mimetic, commensal, parasitic, and mutualistic relationships. Many ant species are considered pests, and because of the adaptive nature of ant colonies, eliminating the entire colony is nearly impossible. Pest management is therefore a matter of controlling local populations, instead of eliminating an entire colony, and most homeowner attempts at control are temporary solutions, at best. Ants classified as pests include the pavement ant, yellow crazy ant, sugar ants, the Pharaoh ant, carpenter ants, Argentine ant, odorous house ants,red imported fire ant and European fire ant. Populations are controlled most effectively by calling an experienced professional pest control company to professionally assess your unique situation and devise a throrough and effective solution. Call Knott's today for your complete Ant Infestation Solution!